Get free genuine license of PC Tool Registry Mechanic. 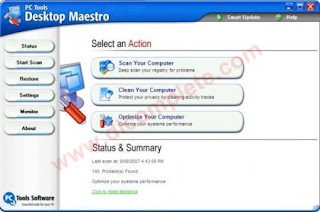 You can get free 1 year genuine license for pc tool registry mechanic in simple steps just follow me.As you know that PCTool registry mechanic is world's popular registry cleaner.Why you need it every having a problem that after he install anything or do anything on his pc cuase registry corrupt and crashes.Registry mechanic allow you to clean fix corrupt and remove invalid registry entries and also optimize the registry and improve your System Performance. Method to get free genuine license of PC Tool Registry Mechanic. 1-Download the special promo version From Here. 2-Go to Special offer promotion page. 3-You should now recieve email from PCTools registry mechanic serial key. Apply this on your registry mechanic and enjoy this full and genuine version and if you need any software,serial,tutorial you can request here.